How would you like to make your entrance? How about astride a giant elephant? Or announced by fanfare trumpets? 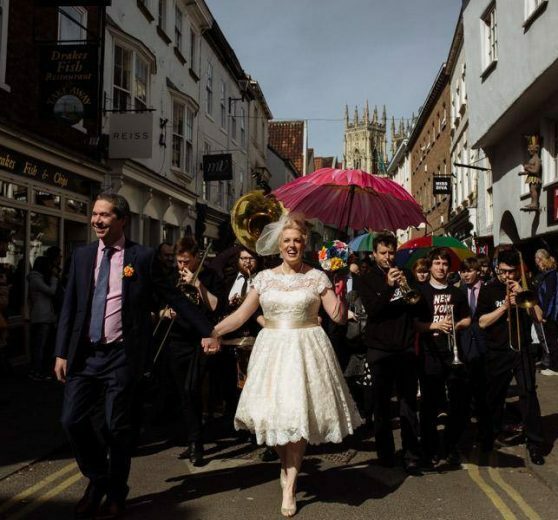 We’ve got brass bands, Scottish pipers, gypsy jazzers, vintage swingers, carnival paraders, acrobats, bands on stilts, walkabout street acts… everything to give you a spectacular arrival! The band were great, just what we wanted. Thank you so much for sorting it out, you were extremely helpful and I really appreciate the personal attention you gave us. Would definitely recommend you – in fact already did to a couple of people who asked about the band!